Iron, an essential trace mineral, is needed to ensure the delivery of oxygen to the tissues and muscles in your body. Iron deficiency is the leading nutritional deficiency on the planet, with the World Health Organization estimating that 2 billion people -- roughly 30 percent of the world's population -- have iron deficiency anemia. Too much iron, however, can be dangerous. Don't take iron supplements unless you are under the supervision of your doctor. Iron is an important component of hemoglobin and myoglobin, the proteins involved in oxygen transport to tissues and muscles. Iron is also needed for cell growth and differentiation, as well as for the synthesis of the body's energy source. Insufficient intake or absorption of iron causes iron deficiency anemia, which comes with fatigue and lowered immunity to disease. People at risk for iron deficiencies include pregnant women, marathon runners, vegetarians and those with malabsorption syndromes. Excess iron -- a condition called hemochromatosis -- can cause darkening and bronzing of the skin, liver damage and diabetes. Megadoses of iron, 50 to 100 times greater than recommended doses, can be fatal. Daily iron requirements fluctuate according to age. University of Maryland Medical Center reports that infants 7 to 12 months old need 11 milligrams of iron a day. Babies from 1 to 3 years old only require 7 milligrams; the amount jumps to 10 milligrams for children ages 4 to 8. Children 9 to 13 need 8 milligrams. At ages 14 to 18, gender differences come into play, with male teenagers requiring 11 milligrams; teenage girls in that age bracket require 15 milligrams. From age 19 to 50, daily values remain consistent, with men needing 8 milligrams and women requiring 18 milligrams. Pregnant women should have 27 milligrams; breast-feeding women only need 9. After age 50, men and women alike have iron needs similar to that of a preteen -- 8 milligrams a day is sufficient. Dietary sources of iron can be divided into two categories: heme and non-heme. 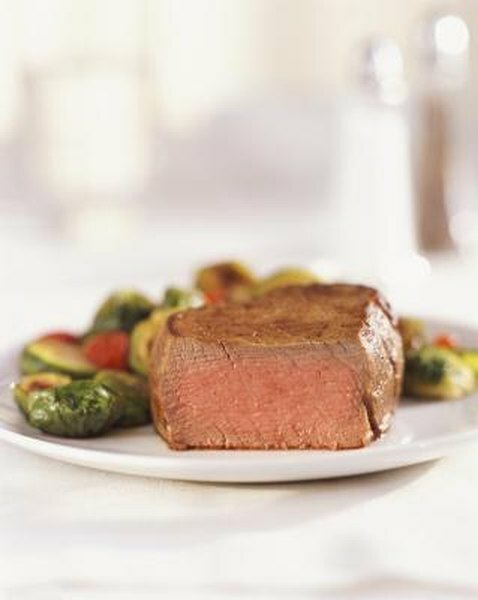 Heme iron comes from hemoglobin and is found in animal foods, particularly red meat, poultry and fish. Chicken liver is among the high ringers of heme iron content, providing 12.8 milligrams in a 3.5-ounce portion. Six oysters contain 4.5 milligrams, while a 3-ounce serving of beef tenderloin offers up 3 milligrams. Legumes and iron-enriched foods provide iron as well, but in the form of nonheme iron, which is not as easily absorbed. A 3/4-cup serving of 100 percent iron fortified cereal has 18 milligrams of nonheme iron, while a cup of fortified prepared instant oatmeal has 10 milligrams. A cup of pinto beans offers up 3.6 milligrams. The Office of Dietary Supplements reports that vitamin C can help vegetarians absorb nonheme iron, while tannins -- found in black and green tea -- decrease absorption. If you are diagnosed with iron deficiency anemia, your doctor will probably prescribe iron supplements of approximately 100 milligrams a day for six months to one year. Side effects can include digestive disturbances, such as nausea, heartburn, constipation and diarrhea. The University of Maryland Medical Center warns that iron poisoning is the most common cause of accidental poisoning deaths in children. Keep iron supplements in childproof bottles and out of children's reach.